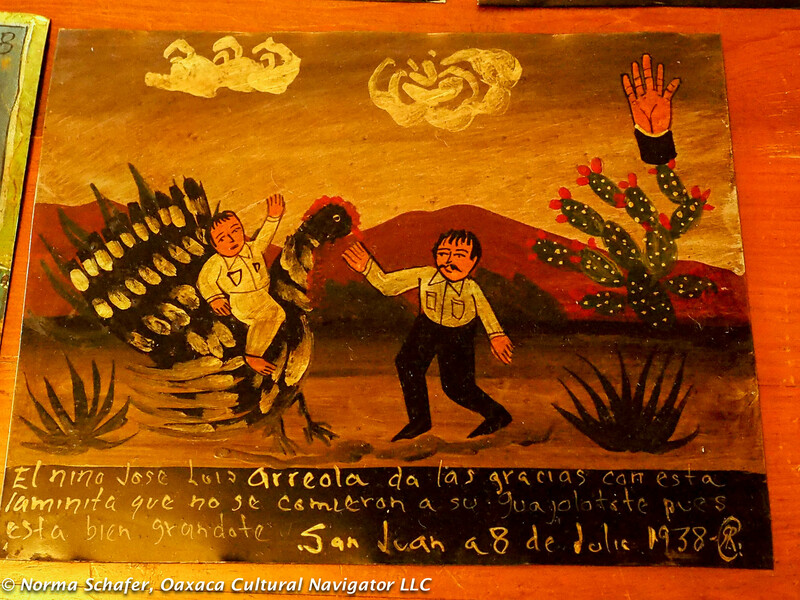 Mexico’s Ex-Votos are naive folk art that tell a story of thanksgiving for being saved from near-death or disaster. Yes, it was a miracle to survive. Usually, the person who escaped tragedy would hire a local artist to paint a tin square depicting the scene. The message of thanks may have included many misspellings, as the painters were not educated. They often include depictions of the saint to whom the supplicant is sending prayers of thanks. 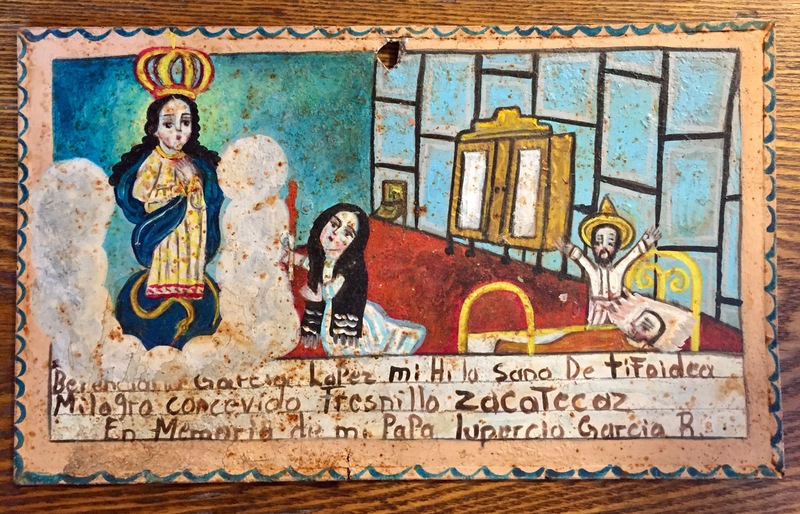 Original, vintage ex-votos were taken to a nearby shrine where the person, with hammer and nail, would affix the small painting to a tree or post or altar. 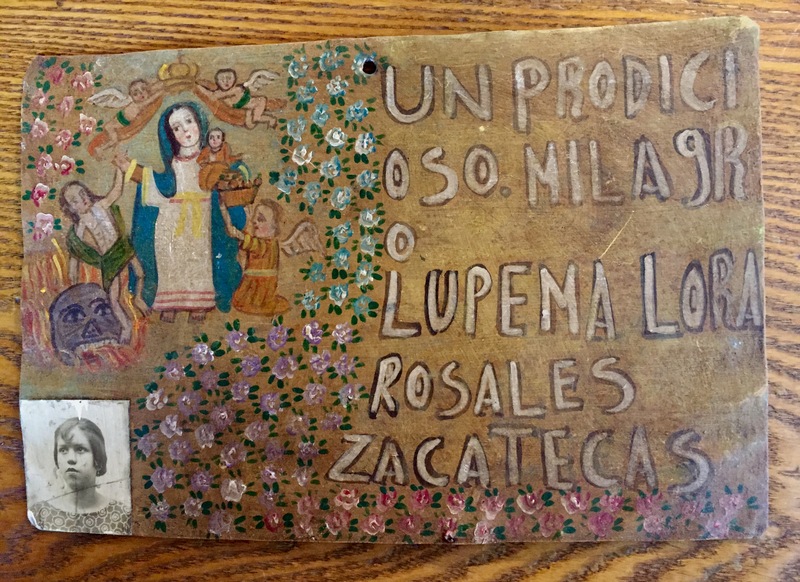 Hence vintage ex-votos usually always have a crude hole in the top center of the plaque. Today, I am offering six ex-votos for sale. One is a vintage piece from the 1930’s. 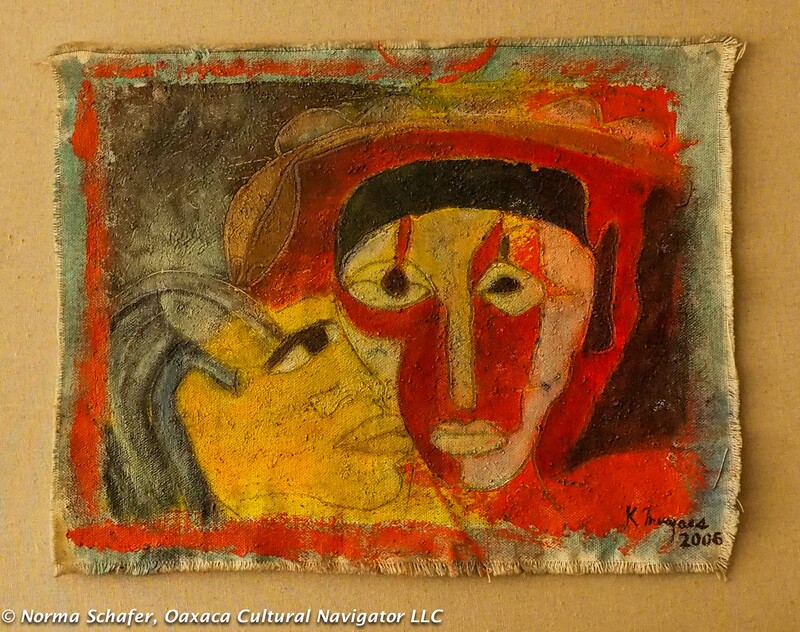 The others are reproductions recently painted by Mexico City folk artisan Rafael Rodriguez. I acquired these from a Mexico City collector. Below, by the miracle of faith, Lupema Lora Rosales is saved. We even see her photo in the ex-voto. SOLD. #1. A prodigious miracle Lupema Lora Rosales, Zacatecas. Vintage, 1930’s. 6-3/4″high x 10″wide. $195 USD. To Buy: Please send me an email tell me which one you want. Please identify it by the NUMBER and include your mailing address. I will send you a PayPal invoice for the piece plus shipping cost based on your location. I will ship to the USA and Canada. Thank you very much. Below, a Franciscan friar gives his blessing when the four-headed monster is vanquished. SOLD. #3. Carlota Gonzalez thanks me for getting rid of a monster who attacked her because he has many heads. Oaxaca 18 de Mallo (May) 1939. New. $125 USD. Below, the Virgin of Guadalupe is watching over Aristarco Lima! SOLD. #4. 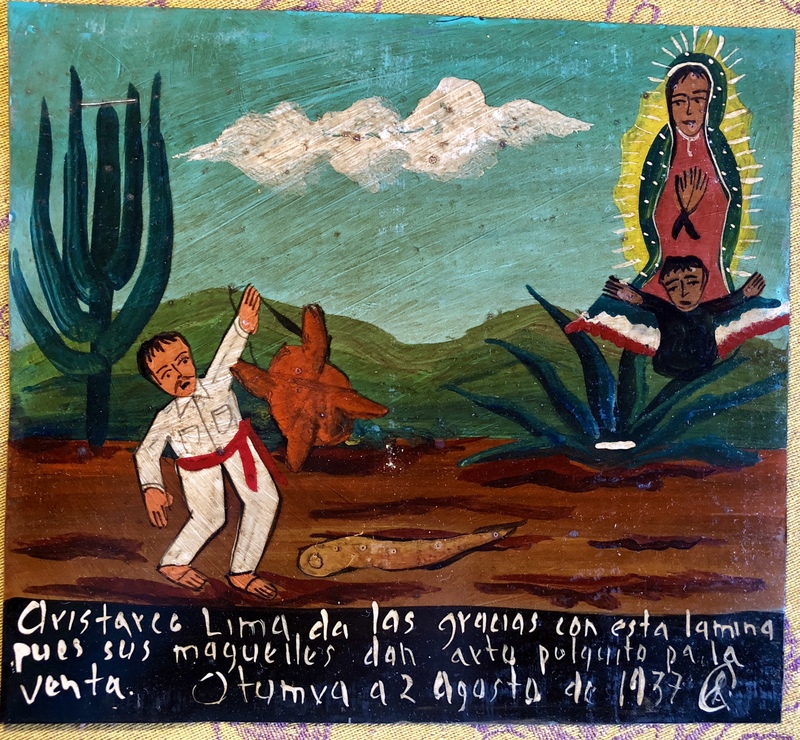 Aristarco Lima gives thanks with this ex-voto because the cactus gave a little worm for sale. Otumvo de 2 Agosto 1937. New. 9-1/2″ h x 8-1/2″ w. $85 USD. Below, a duel NOT to the death, thanks to the Virgin of Soledad. Ex-votos are often exaggerations with larger-than-life figures illustrating the peril that was dodged. SOLD. #6. A horrible socorpion attacked and grabbed Anastasio Valencia as he ascended from the pit well. San Jose, May 11, 1939. New. 9″h x 9-1/2″ w. $85 USD. 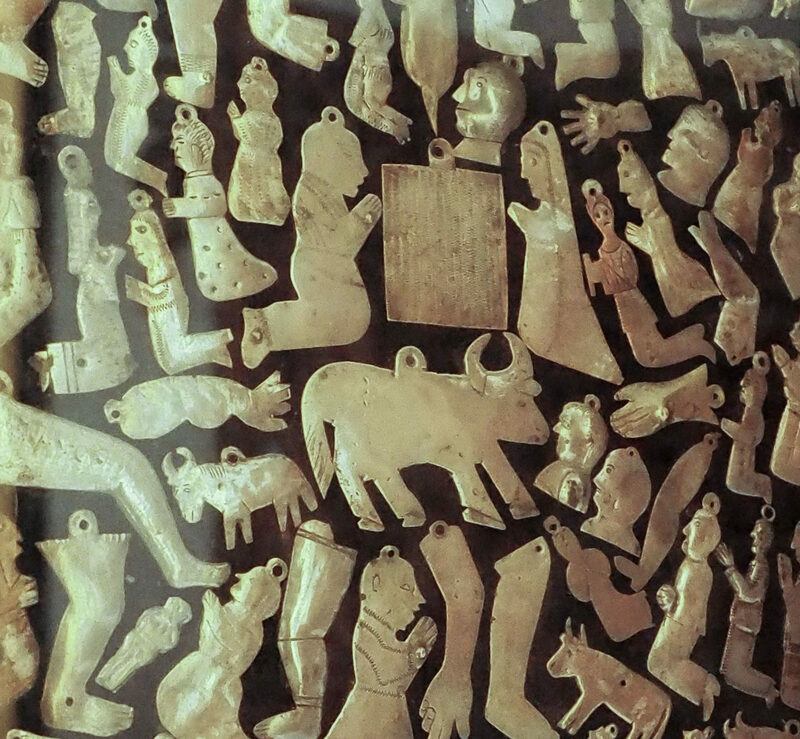 Ex-votos came to Mexico from Spain with the 1521 conquest. They are devotional prayer plaques applied to shrines in thanksgiving for a miracle received from a particular saint. 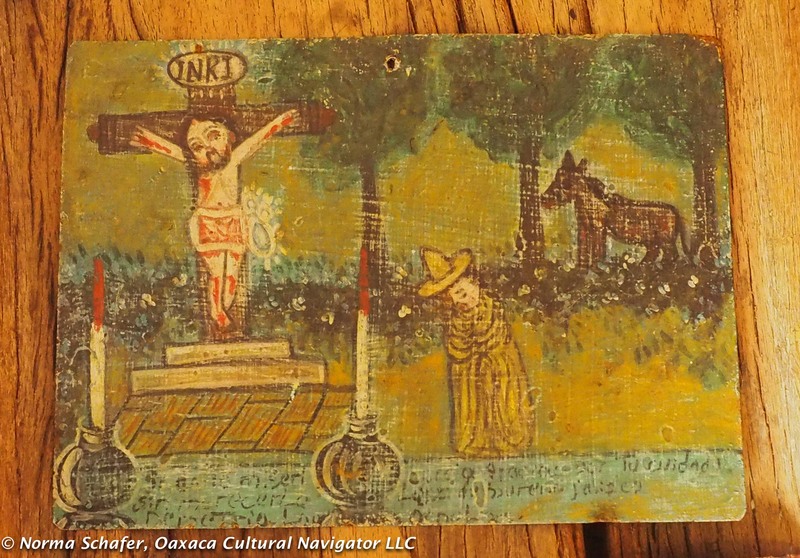 These small votive offerings are hand-painted on tin and naive folk art. Usually the supplicant, the person giving thanks for the miracle, hired a local untrained artist who could also write to express gratitude. Often, though, you find misspelled and illegible words, which reflects the lack of sophistication and charm of the piece. The painting often includes the name of the town or province and the date of the offering. They were usually nailed to an altar or shrine. 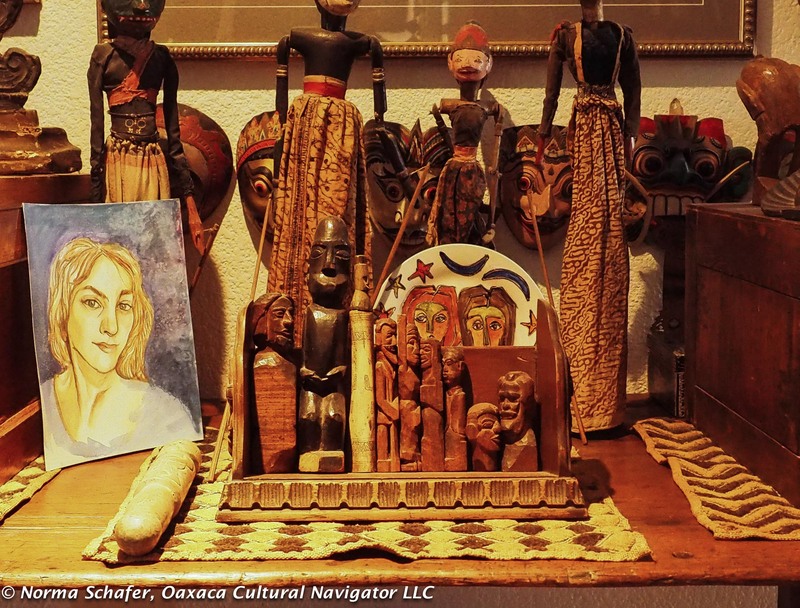 Frida Kahlo and Diego Rivera had one of the largest collections of Ex-votos, many of which are on display at Casa Azul in Mexico City. #1. San Martin Caballero. 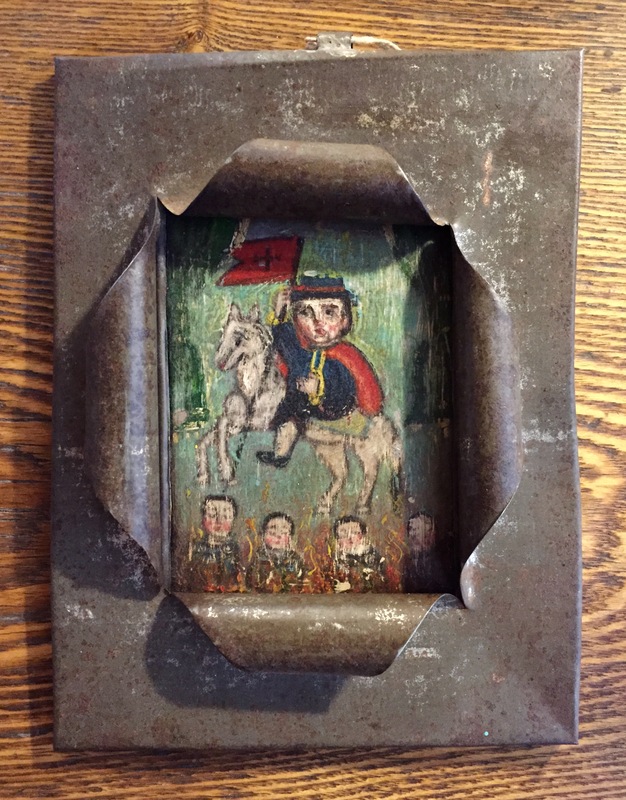 This first one, below, is a naive vintage painting on tin, surrounded by the original tin frame, of Saint Martin on Horseback. Saint Martin (San Martin) of Tours is usually depicted giving a piece of his cloak to the poor. 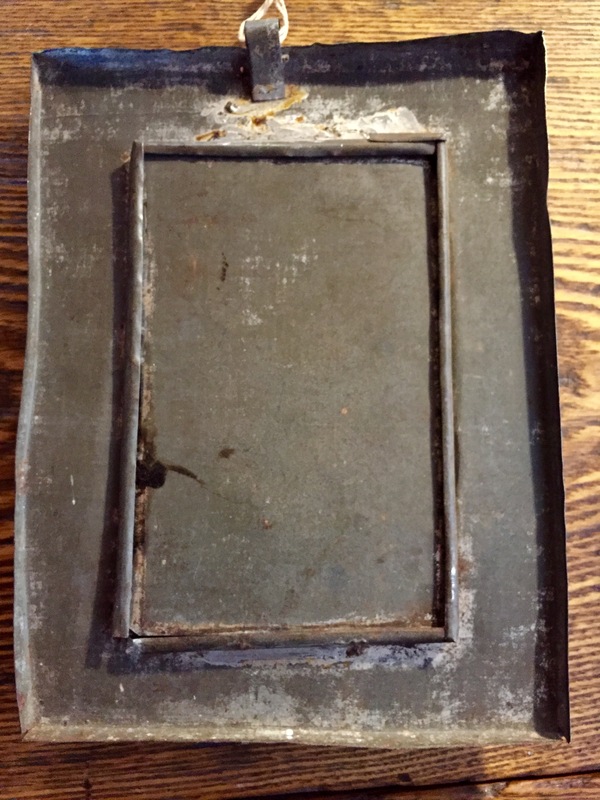 My art collector friend says this is from the 1930’s to 1940’s, though it is undated. Size: approx. 6″ wide x 8″ high. $345 USD plus shipping and insurance. Giving thanks for a miraculous recovery from typhoid fever. $345 USD. $345 USD plus shipping. Note: Colors are pure, as depicted in photo. Small tear at bottom of the tin border. 1930’s-1940’s. Thanks for a prodigious miracle. #3. 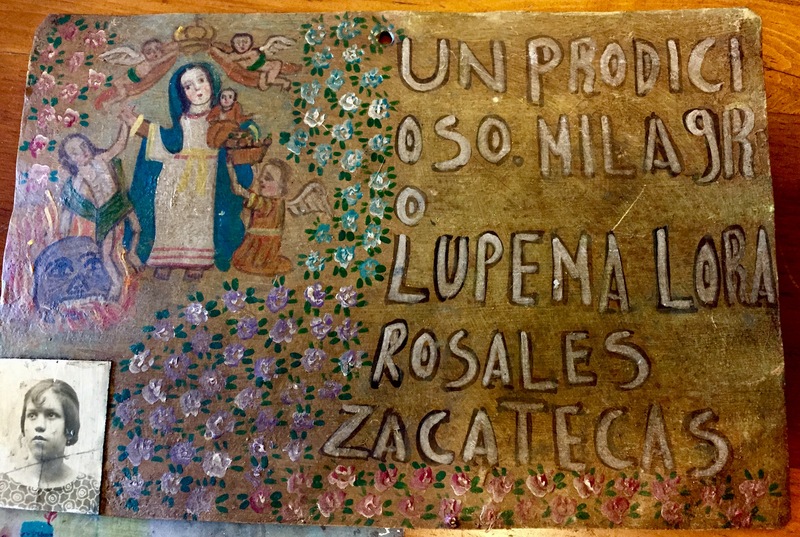 Lupema Lora Rosales from Zacatecas gives thanks for a prodigious miracle. We don’t know what it is, but we see her photo affixed to the ex-voto in the lower left corner — an unusual application! The saint is surrounded by flowers, a burning skull, a naively painted Jesus, and children. $345 plus shipping. 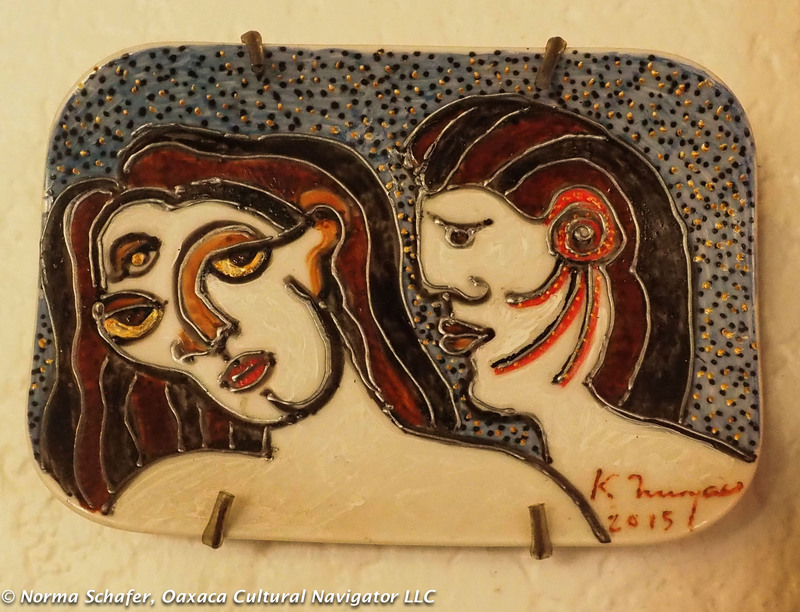 Size is 6-3/4″ high x 9-3/4″ wide (approx.). Condition of Vintage Pieces: These are between 70 and 80 years old. 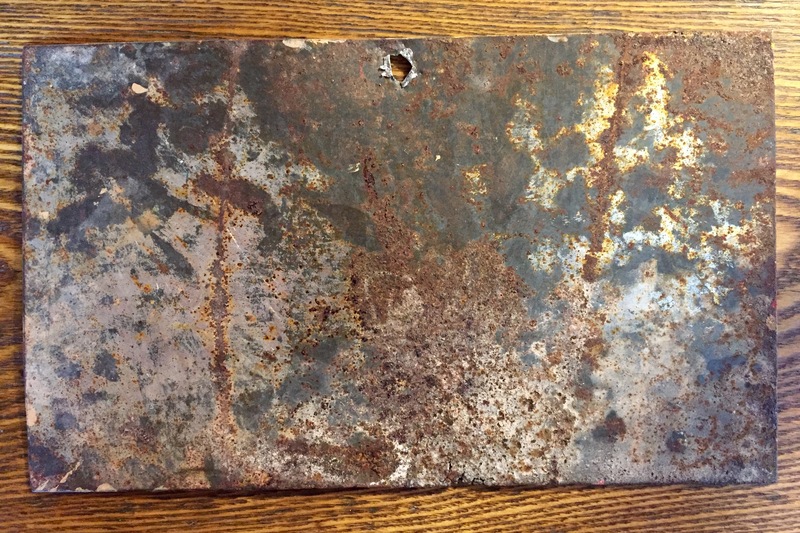 There will be some surface scratches, rust and imperfections due to age. 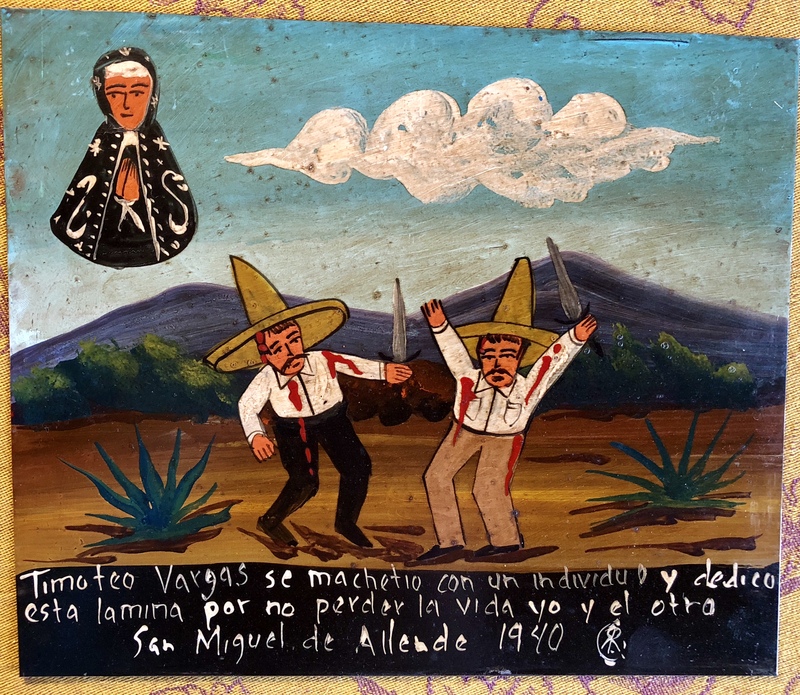 These two ex-votos (below) are painted and signed by contemporary Mexico City artist Rafael Rodriguez, noted for his whimsical ex-voto depictions. They are reproductions based on the artist’s knowledge of the genre. I acquired them. from a well-known collector in Mexico City. It is offered to you for sale. Size: 9-1/2″ high x 12″ wide, at $95 each, plus shipping. 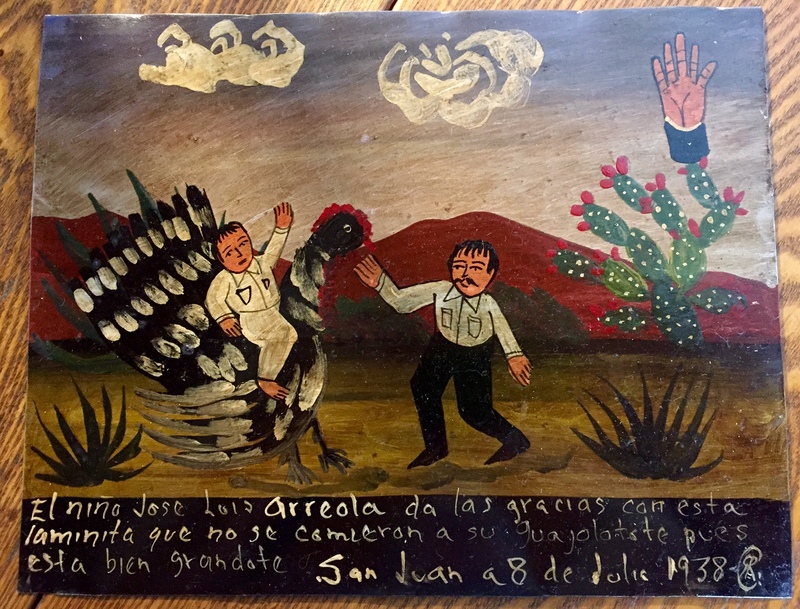 Wild turkey guajolote did not devour the boy Jose Luis Arreola. Give thanks. New. $95. # 1. The wild turkey, Mr. Guajolote, was about to gobble me up! 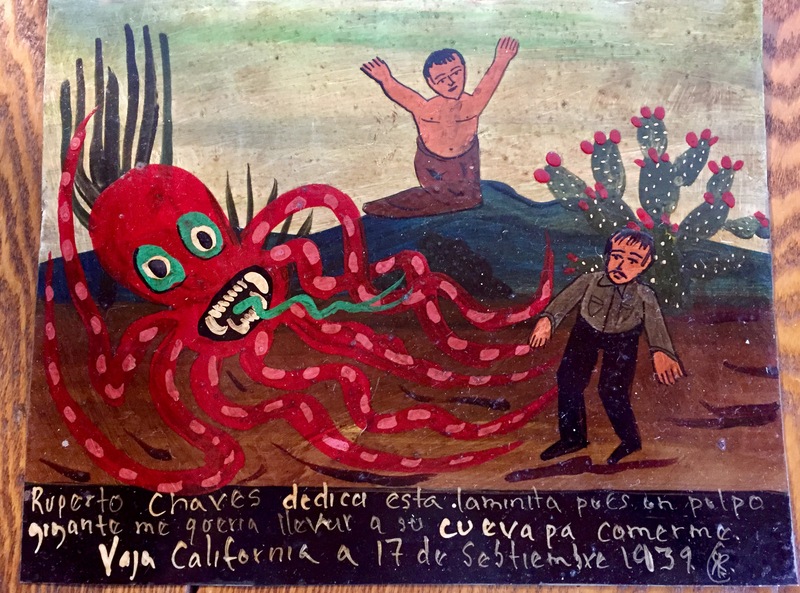 Ruperto Chaves offers thanks for being saved from the giant octopus. New. $95. #2. Imagine being strangled by a giant octopus that suddenly appears from a cave. Terms of Purchase: Please contact me you are interested in purchasing and refer to the subject of the ex-voto or the number. Payment is requested in full with PayPal. I will calculate shipping and insurance based on your mailing address and send you a link for payment. There are no returns or refunds. Thank you. 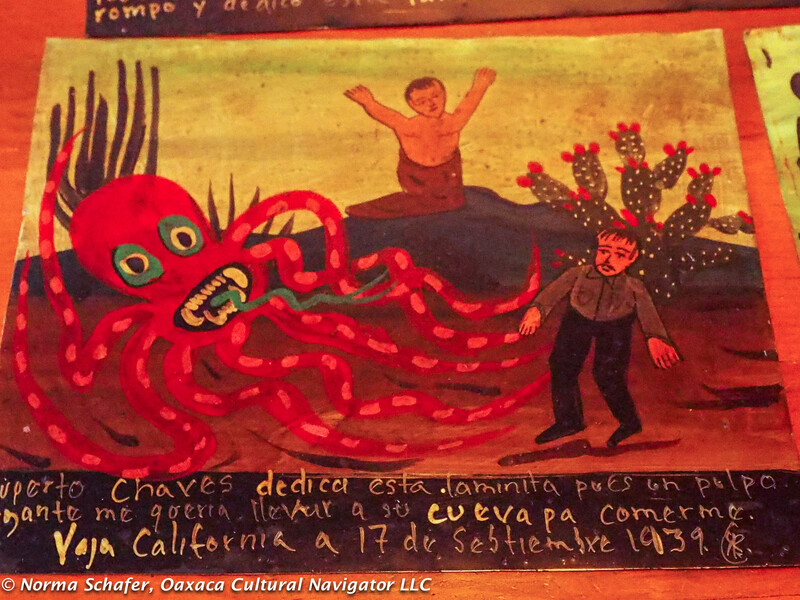 In the third room of Casa Azul you will see a small sampling of a vast collection of exvotos amassed by Frida Kahlo and Diego Rivera. It is said they had one of the largest collections of these small tributes of thanks to a saint for a miracle, for saving a life, a favor received. Domera Morales Rojas Milagro con ce vida. Cholula, Puebla. 1940’s. 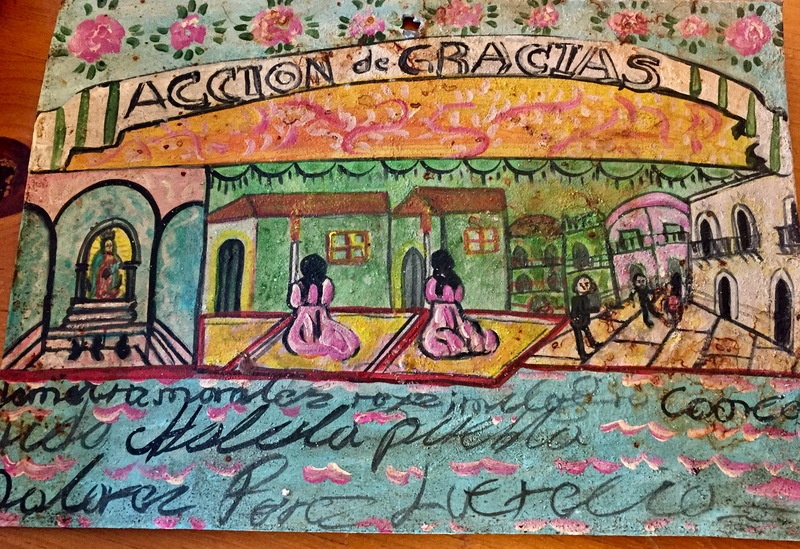 These are charming, naive paintings on laminate, tin, paper or cardboard, made by the person giving thanks. It usually includes a personal message below the scene, along with the name of the petitioner, and sometimes a date. You often see misspellings, incomplete sentences. 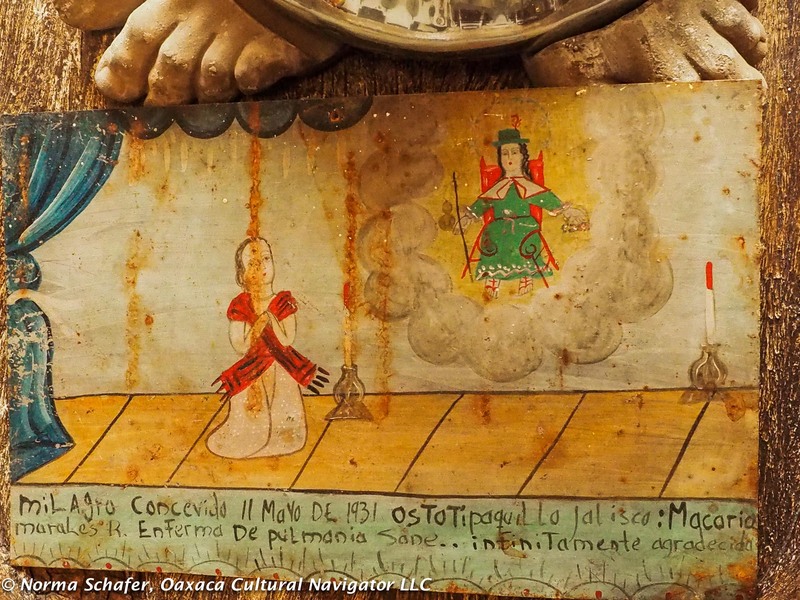 A hammer and nail was all that was needed to attach the ex voto to the shrine in offering. 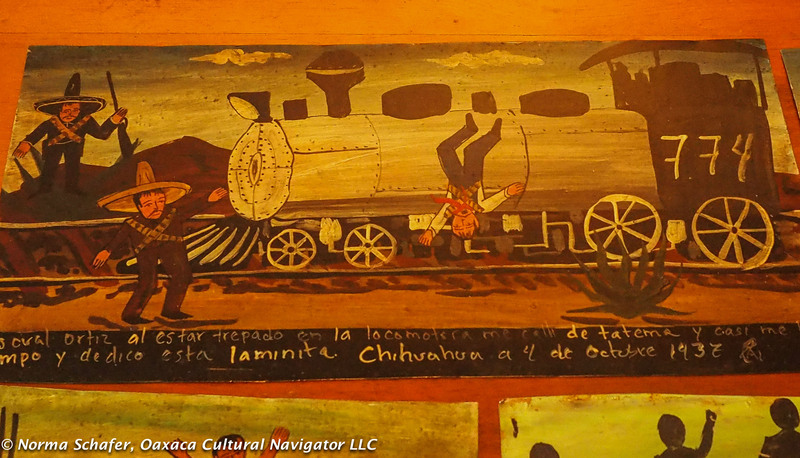 New ex voto painted by Rafael Rodriguez, collectible, riding a guajalote. It is now difficult to find antique ex votos. 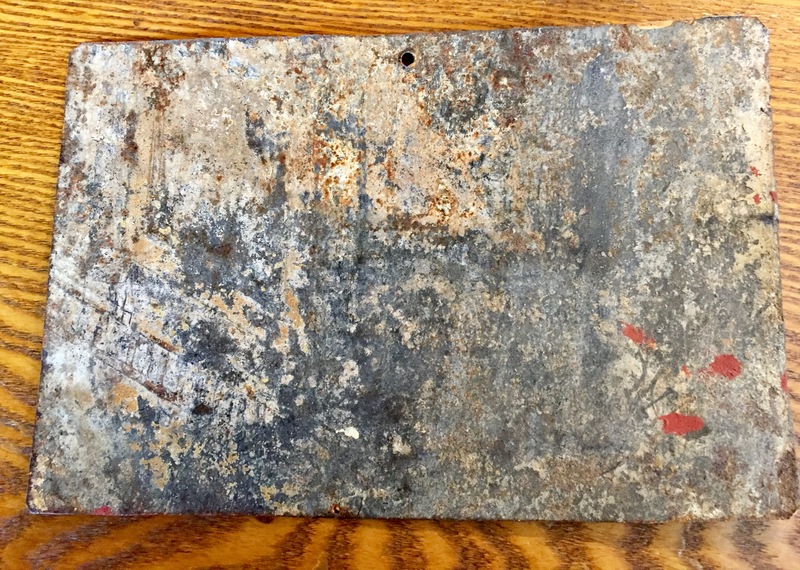 Many we see are painted on distressed tin or steel to look old. Buyers can be deceived and pay a higher price than the piece is worth. A prodigious miracle. Lupema Lora Rosales. Zacatecas. Circa 1940. Vintage. Yet, my tried and true motto is: If you like it, buy it. You may never see a piece like the one in front of you again. Meaningful mementos are important. My other motto, that I learned a long time ago is: There will always be a sale. That is, there will always be something to fall in love with. If you pass it by, there will be something else, but it won’t be the same! Saved from octopus strangulation in Baja, California, by Rafael Rodriguez. New. The day after my visit to Casa Azul last week, I took the Australian group to Bazaar del Sabado in Plaza San Jacinto, San Angel. This is now my favorite place for imaginative, creative shopping in Mexico City. The bazaar, held only on Saturdays, is filled with contemporary art, jewelry, clothing, textiles and artisan designed wares. 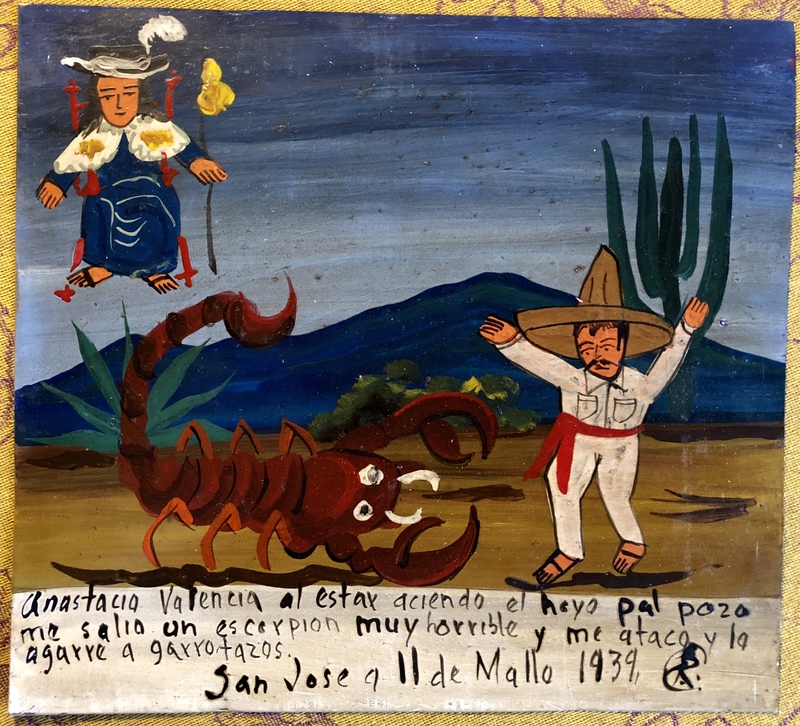 Early ex voto, 1931. Saved from pulminary sickness, infinitely grateful. 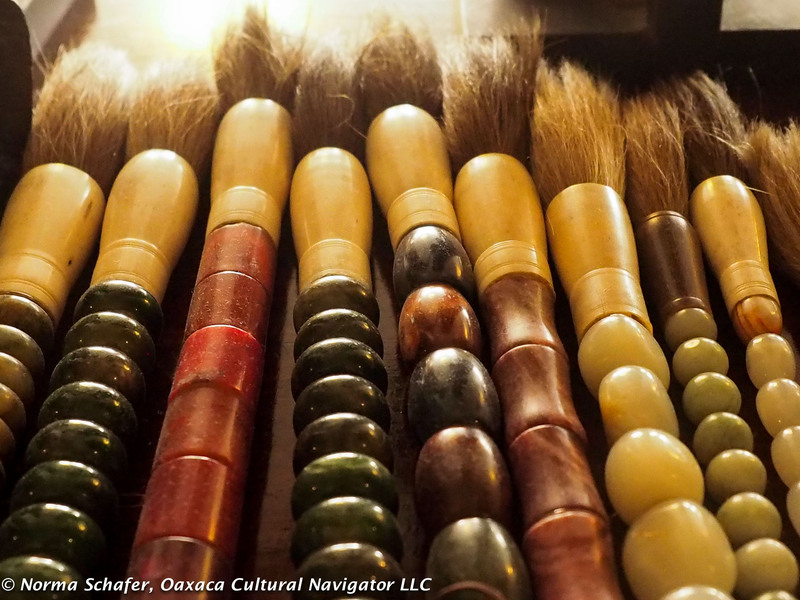 Adjacent streets are lined with boutiques, galleries, and street artisans selling crafts from all over Mexico. Painters and print makers show their work displayed on easels in the surrounding parks. It is a lively place to meet, eat and spend the day. 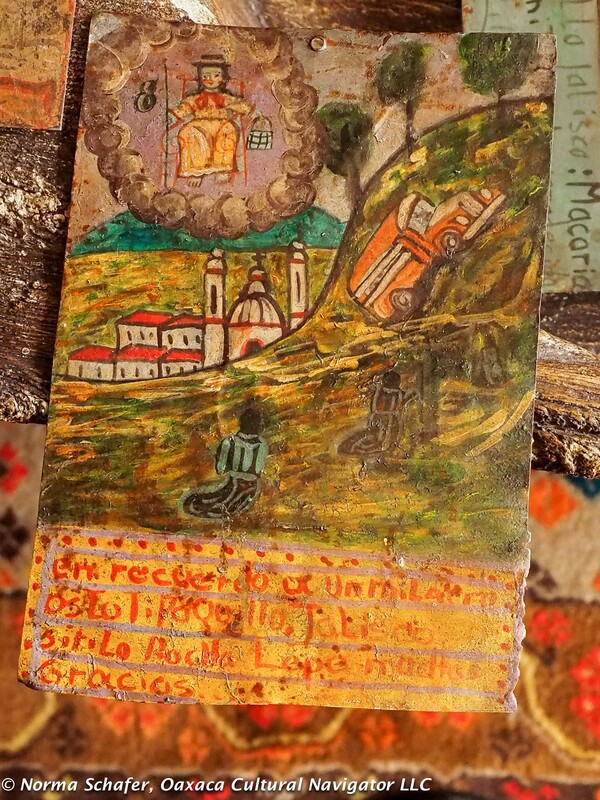 Vintage exvoto, giving thanks for safe journey on treacherous mountain road. My greatest discovery was the small shop operated by Karima Muyaes, whose father was an antique dealer and one of the original founders of Bazaar del Sabado. 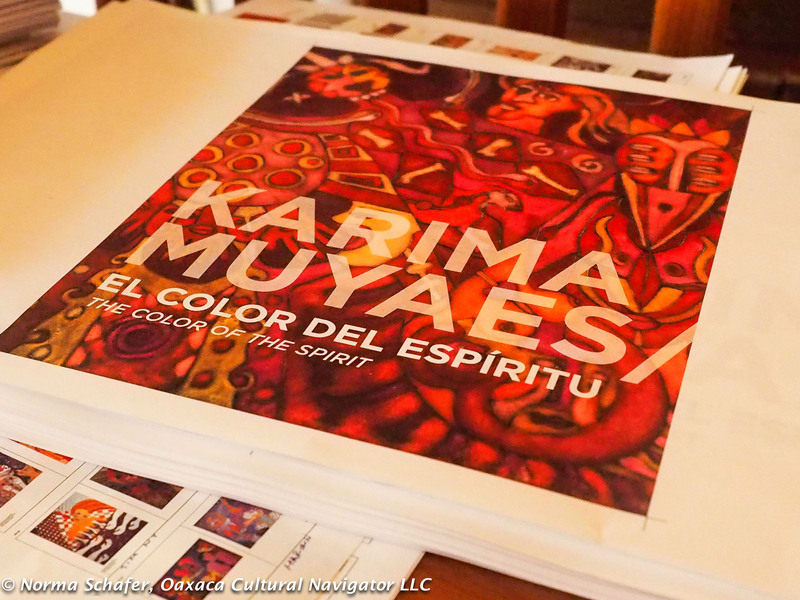 Karima is a talented painter who is in process of publishing a collection of her vast body of work. 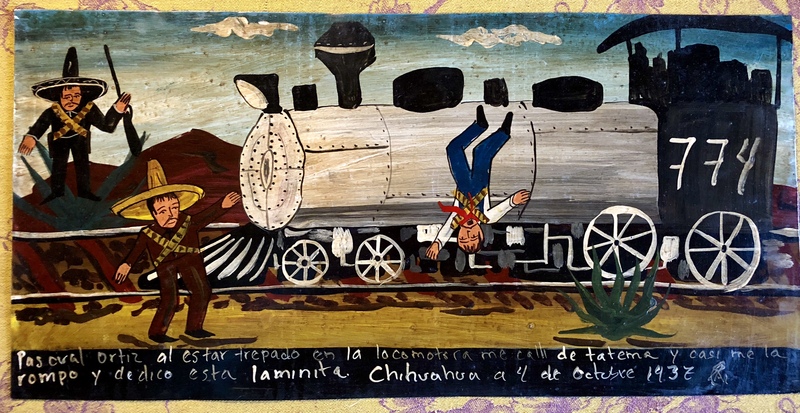 Giving thanks for surviving this train robbery in Chihuahua in 1937. Reproduction. The shop has a selection of fine contemporary ex voto reproductions and I became enamored with the idea of owning one, a la Frida and Diego. Karima is forthcoming about what is old and what is a reproduction. 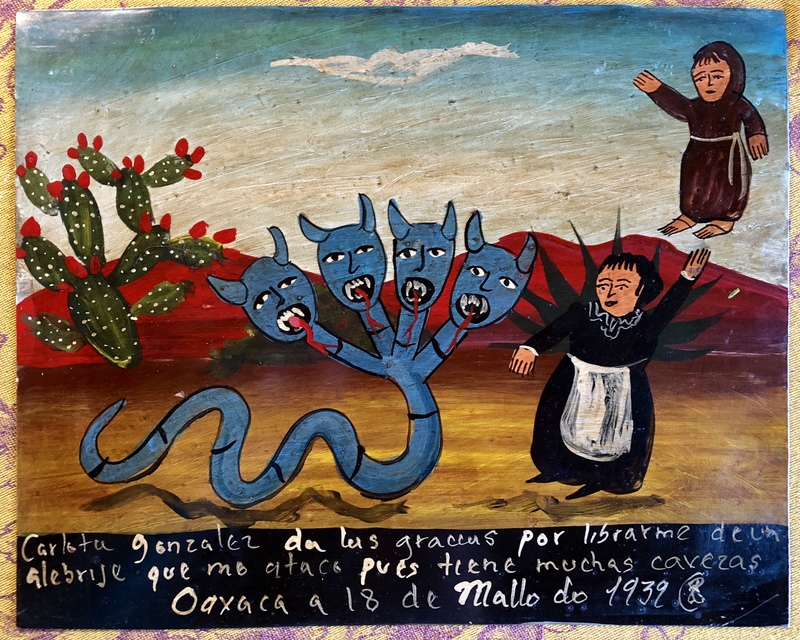 After I bought a blue six-headed sea monster who, ojala (god willing), did not strangle the supplicant, Karima and I talked about our mutual love for Oaxaca. You need a magnifying glass to read this old one! 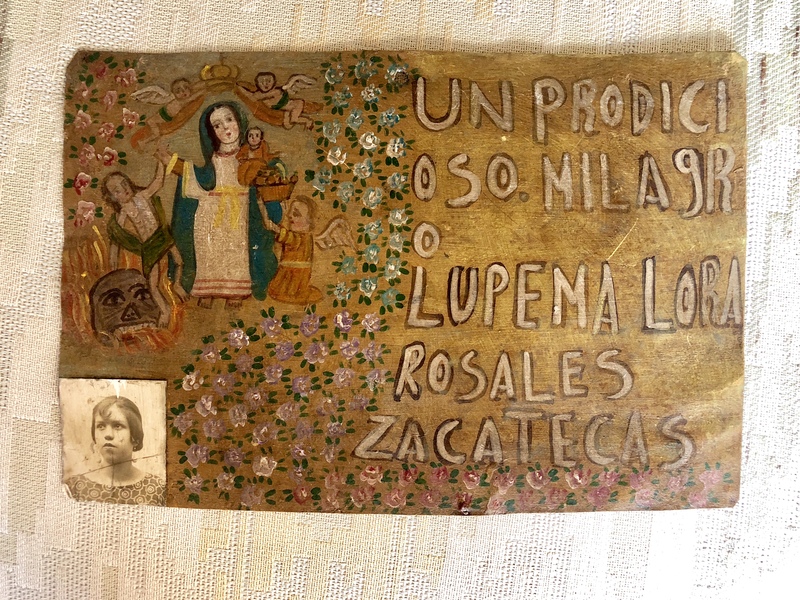 She also told me she had a few vintage ex-votos at her home and invited me to come to visit, which I happily did. The environment is a visual feast in tribute to the work of her father, his collections, and her amazing paintings. She is in process of putting together a photo book of her life’s work. I had a chance to look at the early galleys and meet the graphic designer from Chicago who is working with her on her project. 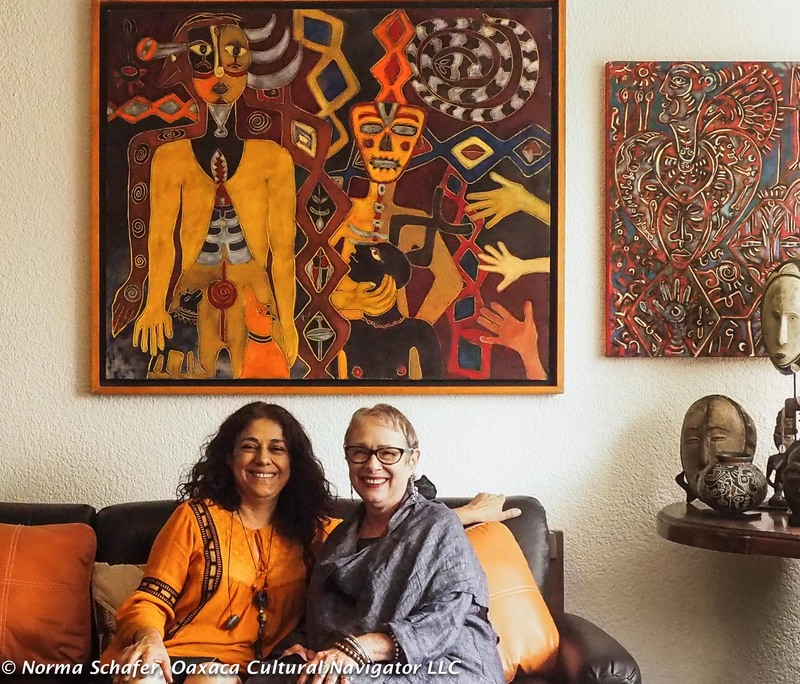 It is likely I will meet Karima again before I leave Mexico City to return to North Carolina on this trip. We will probably visit her studio, where I will take more photos to share with you.